In the year 1505 the Prior of Thurgarton enclosed 6 acres of common land in Thurgarton parish for use as sheep pasture. The Prior urgently needed cash to meet the taxes imposed by Henry VII and wool was more lucrative than arable farming; the records state that the resulting loss of land to the plough team of six men caused considerable distress. This story is typical of the history of land enclosure in England, of centuries of dispute between landowners and local farming communities who struggled to preserve their ancient landholdings and common rights. Land enclosure is reported in every century of the mediaeval and early modern era but it was in the 18th century that it came to a climax. This wave of enclosure was due to several causes but two major factors were the need for more efficient farming methods to feed a rising population and the rise of the free market in farming and speculation in land. Thurgarton has no record of formal enclosure awards or maps but two parish surveys from 1745 and 1777 provide some insight into enclosure and changes in farming in the parish. 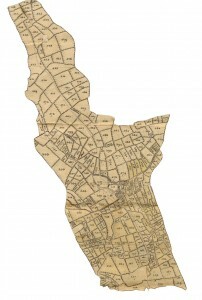 In 1745 Trinity College Cambridge commissioned the land agent Teals of Leeds to survey their Thurgarton estate. The surveyor, Mr Ransom, reported that the college fields ‘are very good so as to bear not only Clover, Turnips, Wheat, Barley, Peas, Oats and Hay but also Flax and Hops’. 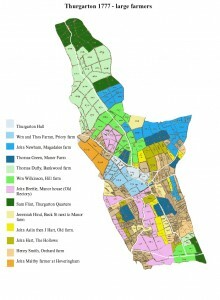 In contrast most of the 1,744 acres owned by the Cooper family in the northern half of the parish was ‘ heavy clay, wooded and rough land’. The Coopers had from Tudor times leased the College estate which in turn they sublet to the local farmers. In this 1745 survey the village farmers complained that’ Mr Cooper grants leases to the tenants for 7 years at back rent and at the end of that term every tenant pays 1 years rent over and above before Mr Cooper will grant him another new lease. The farmers declare that but for the college lands they would not rent Mr Cooper’s land which is inconvenient and of a bad nature and of little worth’. The College owned nearly 800 acres in the southern half of the parish. By 1745 the pasture and meadows of the College’s land had already been enclosed and were rented to the village famers and smallholders at 18s per acre per year. Over 600 sheep grazed on the newly enclosed fields. 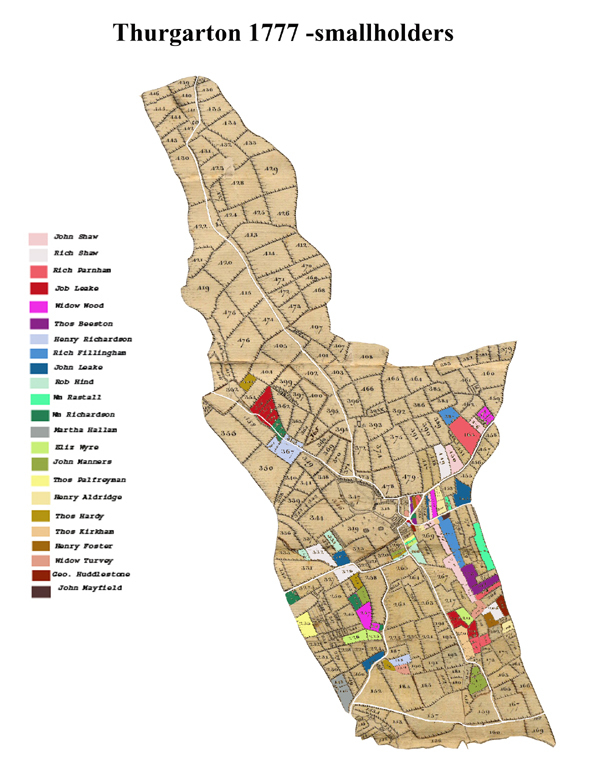 However 111 acres of the old open field plough lands persisted and were still worked in common in elongated strips, called lands or selions in the village records; these were rented for 8s per acre plus 3s per acre tithes. The College also owned all the village plots, cottages and farms. The 1745 survey notes that many of the cottages and outbuildings in the village were’ out of repair and some of the barns and outhouses were fallen down’. In 1745 the village contained five farmers who rented over 50 acres, several who worked 10-50 acres and many small holders renting under 10 acres. 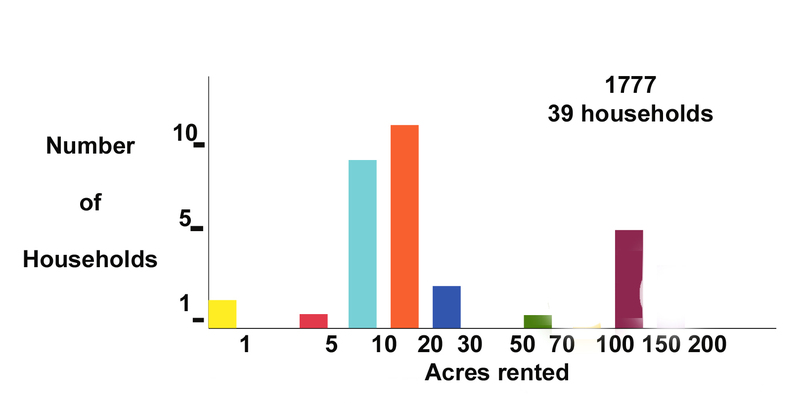 A third of households (yellow column in figure 1) rented less than 1 acre which consisted of a garden and orchard around their cottages; amongst this group were a few artisans, a school master and several elderly inhabitants of alms houses. By 1777 the whole of the parish was enclosed – the once large fields, meadows and woodland were now divided into multiple smaller fields and all were rented out to local farmers both great and small. In 1736 John Cooper of Thurgarton Priory died without children. 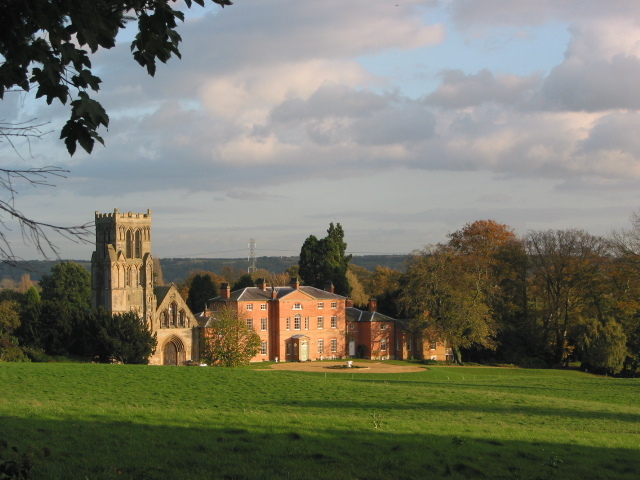 The estate passed to his cousin John Gilbert of Locko Park, Derbyshire who adopted the Cooper name on inheriting the property. He sold his Derbyshire estate and began a programme of improvement in Thurgarton which was continued by his son and grandson (both also named John Gilbert Cooper). The old Tudor mansion and monastic kitchen were demolished and replaced by a brick built Georgian house with newly landscaped grounds, scenic lakes joined by waterfalls and weirs and a walled kitchen garden. This newly drained heavy soil was ideal for grain. Eight large threshing barns date from this period; built of local skerry stone they are dramatic reminders of this age of agricultural improvement. 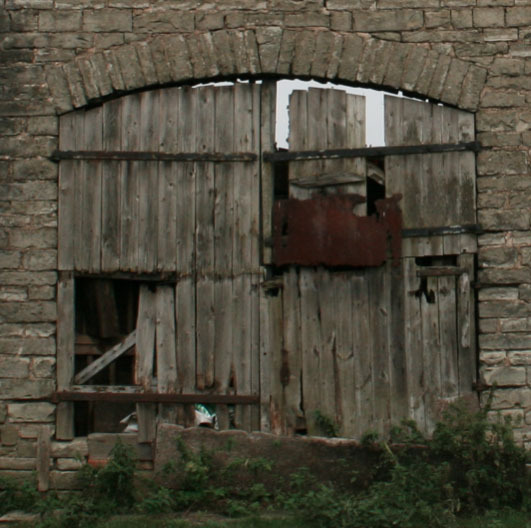 The large central archways allowed a fully laden wagon to pass straight through the barn emptying its load onto the central threshing floor paved with large flagstones. The massive doors were set on elevated door jambs which left a large gap under the closed doors for ventilation. Old threshing barn doors on elevated footings – the 2 foot gap under the door has been filled in. Four new northern farms were rented to tenant farmers from outside the parish community– in 1777 John Newham of Magadales farmed 257 acres, William Wilkinson of Hill Farm 251acres, Samuel Flint of Thurgarton Quarters 209 acres and Thomas Dufty of Bankwood 130 acres. 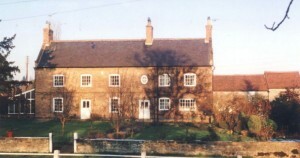 Typical of the many English post-enclosure farms, each farmhouse was sited centrally within its fields and geographically isolated from the village. Farm servants and domestics initially lived within the farmhouse and outbuildings. By the mid 19th century the northern half of the parish contained five compact farms (with the addition of Checkers Farm ), each with its adjacent tied cottages built for the farm labourers. By 1777 all the college land including the old strip plough lands had been enclosed bringing to an end over eight centuries of the old village farming system. According to many historians enclosure led to the division of rural parish communities into four groups - the landowners, large farmers , small farmers and lastly a mass of landless wage dependant labourers. How well does Thurgarton fit this picture ? Gentlemen John Gilbert Cooper of Thurgarton Priory was the local squire and main landowner and leaseholder of College land. 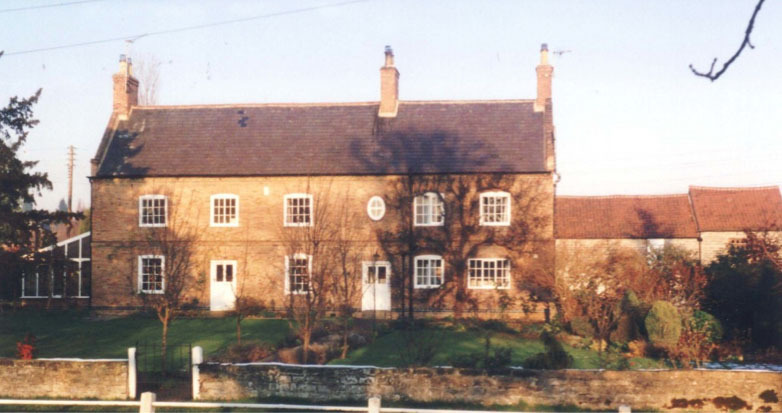 By 1777 farmer John Brettle of The Manor House (now the Old Rectory) was described as a gentleman, he both owned and leased over 200 acres of Thurgarton land which he sublet to his neighbours. Large farmers Six larger farms emerged each working 50 to 150 acres. John Hart senior (The Hollows) and J Hart junior (Old Farm) farmed over 200 acres between them. William and Thomas Farrand of Priory Farm rented 105 compact acres. 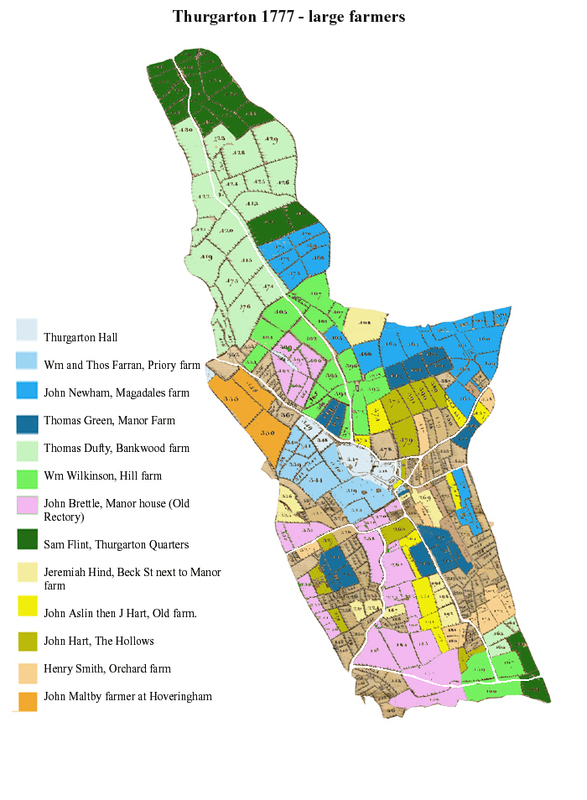 Thomas Green of Manor Farm rented 140 acres and next door was Jeremiah Hinde who worked 106 acres. Henry Smith of Orchard Farm, Bleasby Rd rented 68 acres The fields of these village farms were scattered through the parish – a remnant of the pre-enclosure pattern of landholdings. Over the next century three of the farms come to dominate the village scene –Priory, Manor and Old Farm – but even into the 20th century their fields were far from compact and herds of cows, wagon teams and harvesters criss-crossed the village roads and tracks. 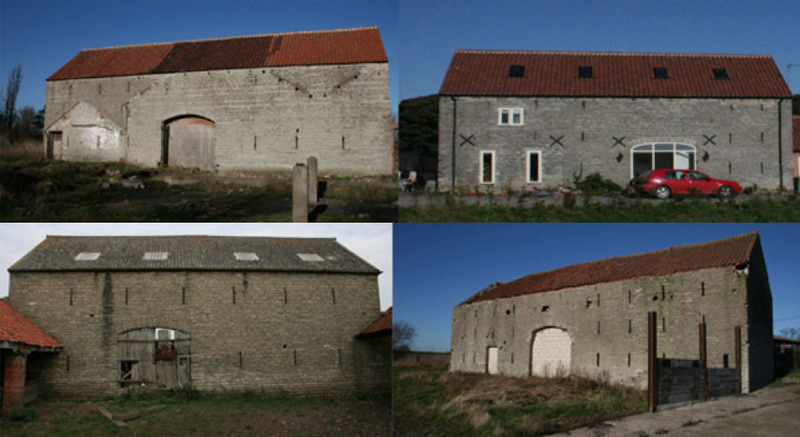 The 1777 survey omits a detailed description of the farms but a tour of the present day village provides several examples of new building in this period – Manor Farmhouse, the barn at The Hollows enlarged by John Hart senior in 1775 and the 1790 threshing barn at Old Farm by J Hart junior. Throughout the village one sees older stone barns being enlarged with brick extensions – some are Victorian but several date from the 18th century. Small farmers Thirteen farmers held 10 to 30 acres and nine 5 to 10 acres. 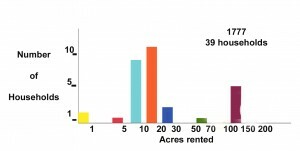 Over 60% of the village households rented between 5 and 30 acres. Many households who rented less than 5 acres in 1745 had doubled their acreage in 1777, eg. the schoolmaster George Huddlestone who in 1745 rented a small garden and school house has 5 acres to his name in 1777. Again we see a wide scattering of fields, arable and pasture, rented by the smaller farmers. The larger units would have kept the farmer and his family fully occupied but the very small scale tenant may have supplemented his income by working for his larger neighbours. Landless wage earning agricultural labourers The survey lists only three households who rent a cottage and garden with no land. Where then are the landless poor in this survey? The map of the village does not include the alms house shown on the 1730 and 1799 maps. 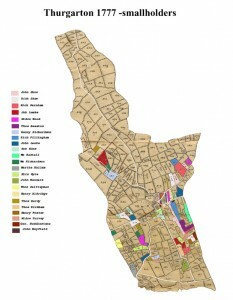 The 1777 survey may be incomplete although it includes 39 households compared to 40 in 1745. If this survey is truly representative there was no great mass of landless wage dependant farm labourers in Thurgarton village in 1777. The situation may have been very different for the four new northern farms where large tenant farmers would have presided over an army of farm servants. The increased landholdings of the vast majority of villagers in 18th century Thurgarton is contrary to a post-enclosure picture of dispossesed pauperised labourers. In the process of enclosing its Thurgarton estate, Trinity College, whether from altruism or good business sense, appeared to have ensured that even their poorer tenants in the village had access to sufficient land to make a living (which of course also enabled them to pay their rents and tithes to the college). 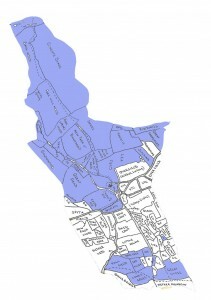 The next article will look at Thurgarton surveys in 1799, 1813 and 1842 and the fate of the village farming community. How would the village farmers cope with the challenge of a free market – under the old system they were part of a close knit mutually supportive paternalistic community but now they had to adapt to a cold commercial capitalistic world.